Image caption Simon Cox: "We're trying to work with our families"
A secondary school is offering parents the chance to take their children out of school for one week in July next year for an "enrichment week". Woodlands School in Basildon says this will allow parents of pupils in Years 7, 8 and 9 to give them "opportunities that are more affordable". Pupils will have to complete a booklet outlining what they have learned. The letter ends: "Holidays at any other time of the year will not be granted and this enrichment week is not transferable to any other week in the school year." Families who take up the offer will need to fill in a leave of absence form and pupils will have to complete an educational booklet while out of school that week. 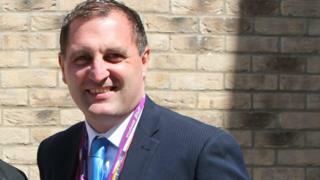 Mr Cox told the BBC News website that the booklet would cover modern languages, history, geography, maths and English. He added: "We get an awful lot of holiday requests - well over 150 a year. "Our authorised holiday is already 1% and we've got 2.9% unauthorised absence. "We're the second highest finer in Essex for unauthorised absence." Mr Cox says the school, which is the fifth most deprived in Essex and has 44% of pupils eligible for the pupil premium, wants to give its pupils opportunities to be successful. "We need to give our pupils an opportunity to do enrichment activities and encourage families to do something worthwhile. "We're trying to work with our families, it's about relationships and we have to pursue that."